Short bio: When she was 11 years old, Ilse was diagnosed with Stargardt's disease. 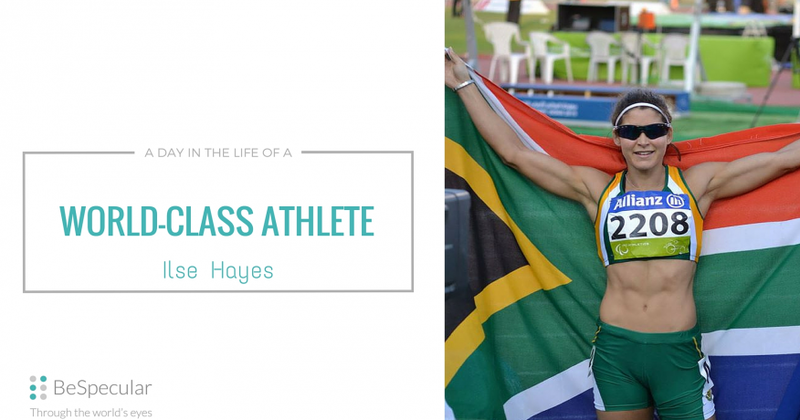 Today, Ilse Hayes is a phenomenal athlete and has competed in the Athens, Beijing and London Paralympics. Ilse is a Paralympian athlete from South Africa and competes mainly in the T13 category sprint events. In 2015, Ilse won gold medals for both the 100m and 200m T13 category at the IPC Athletics World Championship in Doha. At the 2016 Paralympics in Rio de Janeiro (Brazil), Ilse gained silver medals in the T13 100m and 400m races. As a world-class athlete, is there anything in your training that might be different to that of an athlete who competes in the able-body category? Not at all. We, like able body athletes, put in a lot of hours to get the results at the end of the day. Sometimes the only difference is that visually impaired athletes struggle with lower limb injuries more than able body athletes and that is due to the perception of how far the ground is. Our training partners are our eyes on the track. They help us to check if the track is clear and if we are good to go. Between my coach and I we have got a system if she wants to show me certain techniques or how I should run. I have been with her for over 10 years so we have gotten to know each very well over the years. In the athletics world I look up to Shelly-Ann Fraser-Pryce. She is a Jamaican sprinter who has been top of her game for a few years, and she always delivers on the big championships. What I love about her is that she always has a massive smile on her face. She enjoys every second of her time on the track and that is really inspiring. Image: Ilse Hayes, world champion athlete. I love adventure activities (canyoning, zip-lining, rafting, coral snorkelling etc)â€¦sometimes I just need a small push if it's extreme. Does technology play a part in your life as a VIP? What devices, apps, services, etc. do you use? Tech services like Uber have changed my life forever. Technology over the years have really made my life easier. During my honours year at university I used my "Easy Reader" a lot. Magnifying glasses have also been evolving over the years and its my best friend - it's part of the checklist: phone, wallet, magnifying glass. In terms of computers, I use the program Zoomtext or I use the magnifier function and operate normally although it takes a bit longer than the usual person as we have to scroll much more across the page. Cellphones I cant even begin with! Touch screens have made everything much easier where just by the drag of a finger the font enlarges as easy as that. Other tech services like Uber have changed my life forever. Now I don't have to be so dependant on other people, which is great because I struggle with that concept. Most mornings I wake up between 6:30am and 7:30am depending if I have a track or gym session. I start off my day with some glutamine that helps with muscle recovery followed by a bowl of oats. One of my training buddies lives around the corner so I get a lift with him to training. At training I don't really use any VIP tools except sunglasses as my eyes are very light sensitive so you will never find me without them. Training lasts about 2 hours and then I take an ice-bath to speed up the recovery in order to be fresh for my afternoon session in the gym. I use Uber to get back home. Uber has really changed my life and made me less dependant on other people. I would normally go home after training and have lunch. Once a week a friend and I have a lunch date but it varies according to our schedules. Lunch would consist out of either a tuna salad and a fruit, a chicken wrap and salad, or a gourmet sandwich and salad. If I haven't had coffee in the day I would have a nice cup of coffee with that. Image: Ilse Hayes, world champion athlete, running in a race. I try and take a power nap of about 30 min before I get ready for my gym session. I would use Uber again for transport. Gym is about 90 min and then I get a lift home again with my friend. We are both foodies and love to cook! My mood is very dependent on how my training was during the day. Mostly I have good days but there are those odd days where nothing clicks. My mood quickly changes when my husband gets home and we make supper together. We are both foodies and love to cook! We try out a lot of new recipes and experiment with food. We love Italian dishes and are also fond of Mediterranean flavours, and don't let us get started with curries! We are very social so most nights we have friends over for dinner or we are out having a good time with friends elsewhere. We have a set date with our TV when we are home at 19:30 to watch our favourite series: Binnelanders. In winter we love to start up the fireplace and each grab a book and just relax. I also try to aim to get 8 hours sleep in as it is a very important part of my recovery. Thanks, Ilse, for sharing your thoughts with the BeSpecular community! We can't wait to cheer for you at the World Para Athletics Championships taking place in London from 14-23 July 2017!